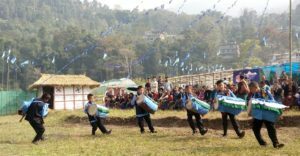 The second edition of Sukhim Chaasok Tong Nam, Limboo Cultural Fest, has started with series of activities at Saramsa in East Sikkim on Friday. The three-day long fest is being organised by Neeyara Production. The festival has started with offering of prayers to the nature and deities. The three days of the festival will have competition of traditional dances like Ke-lang [Chabrong], Yarak [Dhan] Nach, Hak-Pare Samlo, Khiyali Samlo and others. The venue of the festival also has traditional food stalls and museum of traditional artefacts. The festival has also included kids fashion show of traditional costumes of different communities of Sikkim and quiz competition. An organising committee member, Niyari Subba mentioned that the main objective of the event was to preserve and promote tradition, culture, language, dances, costumes, ornaments and food of Limboo community. “The competitions in the event will provide a platform to talented artists and groups to showcase their talents and also to create awareness among young generation about the traditional and cultural heritage of Limboo community,” she added. She informed that the event will also have traditional sports of the State which have not been much known to young generation at present. Ms Subba informed that the fest has participation of Limboo community members from across the state, neighbouring hills and other parts of the country and Nepal. “The last edition of the fest was a learning experience for us to organise this year in grand manner and we will work hard to organise annually in grander manner in the future,” she stated. The competitions will be judged by experts and experienced artists and carries cash prizes, trophies and certificates. “This fest is not just a festival of Limboo community but for entire people of Sikkim. So we request people to be the part of the fest,” she said.